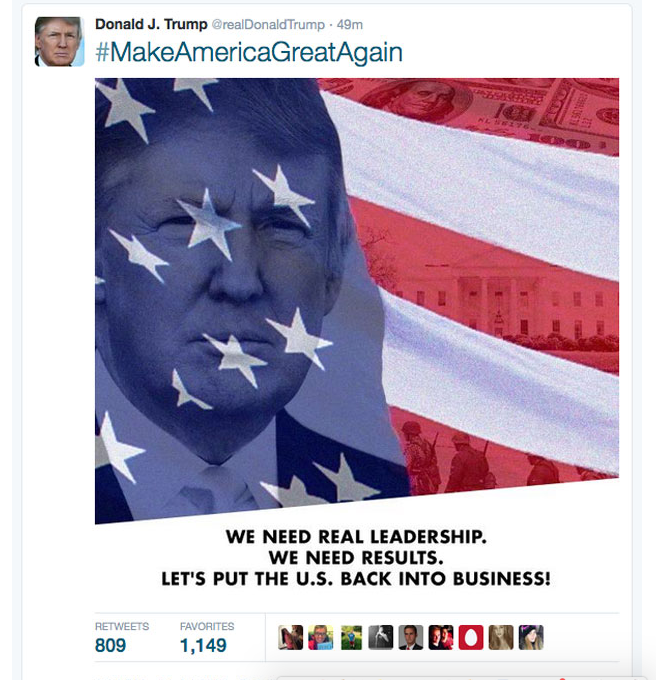 At first glance, Donald Trump's latest campaign image — the candidate's face superimposed against an American flag with soldiers marching in the background — seems innocuous. But John Schindler, a former professor at the US Army War College, noticed something odd about the photo: The soldiers behind the American flag are dressed as elite Nazi Waffen-SS soldiers. Military history buffs spotted the Nazis in Trump's tweet within minutes after it was posted. "One of my followers tweeted at me, curious if the soldiers were Wehrmacht," Schindler told VICE News. "But it's actually much worse: they are SS." A few things tipped Schindler off about the soldiers, including the style of their uniforms, the shape of their helmets, and their shirt cuffs. "The real clincher is above that on left arm, midway up biceps there's an eagle," he said. "That was worn a Waffen-SS only." "This is the sort of thing German law enforcement investigates," Schindler said. The Trump campaign quickly deleted the tweet, and reportedly blamed an intern for the mistake. Schindler wasn't buying the intern excuse. Twitter sleuths later discovered that the soldiers in the image were not original SS members, but rather re-enactors wearing authentic uniforms.